The newly designed Windtunnel MAX Pet Plus is a full sized upright vacuum cleaner that can handle entire household cleaning on a regular basis. 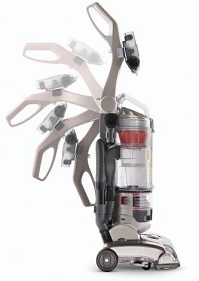 It is especially effective against pet hair via the unique hair grabbing attachments: the Turbo Tool and Static Tool. Anyone who has ever had pets in their home knows just how difficult it can be to clean up after they shed. These 2 tools can be used in conjunction to pick up even the most stubborn hair from your furniture, bedding, clothing, and stairs. The Multi-Cyclonic design contains 3 suction channels and 12 different interior cyclones to keep the air moving quickly through the machine, stirring the dust up just enough so it will pass directly into the collection chamber. If there’s one thing Hoover is known for it’s power and any of the vacuums in the Windtunnel lineup will deliver. And throughout the entire cleaning session you will experience almost no loss of suction at all. With minimal rinsing of the filters and the occasional emptying of the dirt collection canister you will keep it operating at peak performance. Most of today’s uprights are great at carpeting but don’t work well on smoother floors like linoleum, tile, laminate, and hard woods. However, the MAX Pet Plus has 7 different floor settings so you can easily adjust it when moving from room to room. The 28 foot electric cord also gives a very wide cleaning radius which means you can use it in large rooms without the need for switching outlets. Turn the brushroll completely off via the foot pedal when the spinning brushes are not needed so you don’t leave scuffs or scratches. For the household with pets, it’s not only important to remove the hair that you can see but also the microscopic organisms that you cannot. That is because dogs and cats produce dander in their dead skin cells, which will fall off and can produce an allergic reaction in anyone who comes into contact with it. The Max Pet comes with a water rinsable HEPA filter that is one of the best rated in the industry. It is tested to capture 99.97% of mold spores, pollen, dander, and dirt down to the size of 0.3 microns. It also has carbon activated media to help keep those tell-tale odors under control. The entire filtration system works behind the scenes to remove all of those irritants that you cannot see. Should You Buy This Hoover? The bottom line is the Max Pet is a great choice for homes that have a couple rooms with carpets, one or more pets, and a decent amount of foot traffic. It certainly isn’t one of the cheapest vacuum cleaners but it isn’t the most expensive either. It sits right in the middle on the price scale but provides quite a bit of cleaning ability. It also has more than a 4 out of 5 star rating as recorded on their corporate website which is the clearest indication that consumers love what it provides. Hoover has always been known to give you many years of performance from their vacuums for a reasonable amount of money and this model is no different. However, if you have only bare floors or a smaller house then you can consider a more nimble canister vacuum instead of this full sized upright. To read more consumer reviews at our favorite online store, click here to browse their full lineup.